Grilo Capoeira offers capoeira classes for kids and adults in different cities in the Netherlands, Germany and Portugal. The combination of dance, acrobatics, music and martial arts, makes capoeira a wonderful experience for everyone. Young and old, men and women, beginners and advanced, everybody is welcome. Come and join our training and discover the game of capoeira! Capoeira training with Grilo Capoeira is a work out for the complete body. Once you start following more capoeira lessons, you will notice fast improvement in strength, endurance, coordination and flexibility. In a capoeira game you will constantly react and anticipate on each other’s movements, which will help you develop better reflexes and focus. Next to that, you will work on your balance. You will learn to equilibrate in a range of different poses. Capoeira music has an important role in the game. Capoeira music contains energetic rhythms, which determine the paste and the vibe of the game. During the capoeira class you will learn to play a variation of rhythms on the different percussion instruments, with a focus on technique and the feeling for rhythm. Capoeira music often comes with Brasilian Portuguese lyrics. You will not only work on your physical abilities and music skills, you will also be introduced to a new language and a new culture. The group Grilo Capoeira was founded by mestre Grilo. At the age of 13 Grilo started training in Rio de Janeiro with his mestres Garrincha and Sorriso, co-founders of Grupo Senzala. In 1989 he came to Europe to participate in international capoeira meetings and to perform in capoeira shows around the continent. In 1991 he started Grilo Capoeira Bremen and one year later Grilo Capoeira Amsterdam followed. In the summer of 2009 Grilo was invited by his masters to return to Rio de Janeiro. There he was given the red chord and he became “Mestre”, master in the art of capoeira. Grilo Capoeira Bremen is now led by professor Quase, who reached the status of “Professor” in 2013. Today the group Grilo Capoeira is located in Amsterdam, Leiden, Zoetermeer, Voorschoten, The Hague, Bremen and Rogil, with capoeira training offered by a team of enthusiastic and experienced teachers. 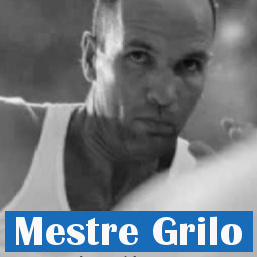 Every week you can follow classes in Amsterdam and Leiden with Mestre Grilo, and on a regular basis he still teaches capoeira in Bremen. The rest of the classes are offered by the other team members, professor Quase, professor Platina, professor Los Andes, professora Segredo, Garoto, Ponei, Role and Vassourinha. Would you like to know more about our capoeira class? Contact us. Would you like to receive information about our open capoeira events? Subscribe for our Grilo Capoeira Newsletter! Through the year Grilo Capoeira organizes a number of capoeira events and workshops. For these international events we invite mestres and teachers from abroad and from the Netherlands, to give workshops about capoeira, dance, music and percussion. And in the evening it’s time for the Brazilian parties! The events are open for capoeiristas from all levels. Besides our regular city events, you are also welcome to join our yearly events in Portugal and on the Dutch island Terschelling. Being outside in nature plays an important role during these very nice and long weekends!